Cooking with TAY: "Orange Food" Edition: The Dessert Round! It's been decided. It's over for those dead leaves on the dirty ground. Very soon, that truck will pass by and collect them. The leaves shall be escorted to a place where all the good leaves go. Taking their place will be snow and in that snow, the footprints of family and friends on their way to share wonderful food and laughs together. There will be fights over stuffing and later still, political incorrectness with some Cards Against Humanity. This next recipe in the Cooking with TAY: Orange Food craziness is for sharing in those sweet moments with family, or for sneaking in that sweet treat whenever you feel the need. 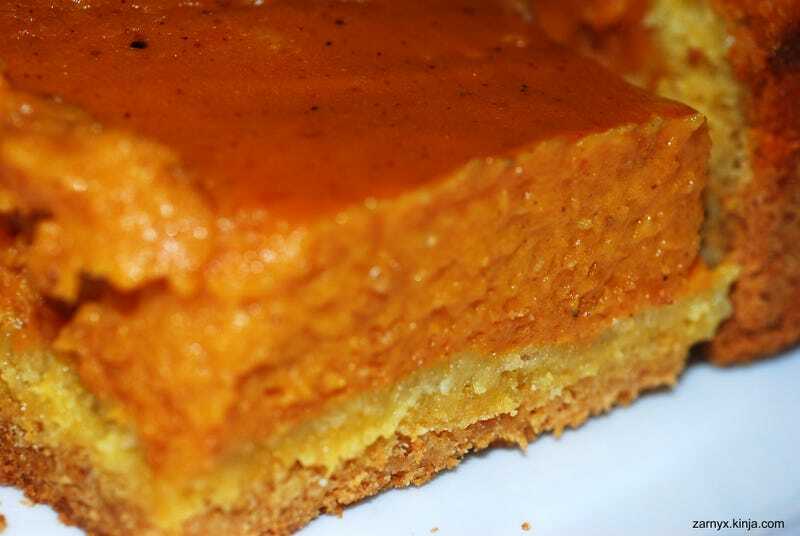 ...Presenting Pumpkin Gooey Butter Cake! To prepare the cake, combine all of the ingredients and mix well. Pat the mixture into a lightly greased 13x9-inch baking pan. This is what the cake mixture looks like: All Crumbly and Buttery. *We cut the sugar significantly because the amount the recipe calls for is just crazy to us. We reduce it by a quarter. In a large bowl, beat the cream cheese and pumpkin until smooth. Add the eggs, vanilla, and butter and beat together. Serve with fresh whipped cream! It needs it to balance that sweetness. I did not make any the last time I made these but I will make sure I do so on Thursday. Happy Thanksgiving, TAY and for those of you who are not celebrating, Happy Cooking*. *Aestevalis, it's easy. I demand that you make it! T., you too. Pumpkins, man. You know you want to.